Glamorous Girl 2014: Summertime Shopping! Today I have a haul to show you all! I love this dress so much, I tried it on and my mom and I were like "must buy"! This does not look cute on the hanger, but on it is really cute, and flowy (I promise)! This didn't photograph well either. On the hanger it looks super big, but it's a boyfriend blazer, so it's meant to be longer and bigger. Sadly I will not be able to wear it in this FL weather right now. It's 99 degrees outside! I love the metallic stripes! Oh how I love summertime dresses! Just some random bits and bobs I picked up. All my bobby pins seemed to have disappeared, so I picked up a new pack. I was out of deodorant so I picked some of that up. 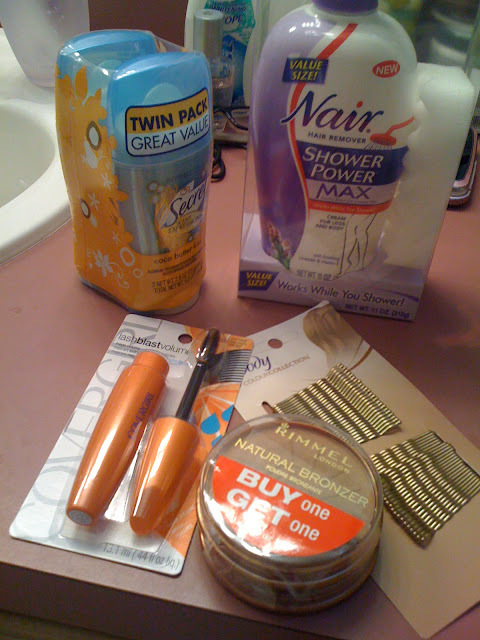 I've been wanting to give Nair a try, so I also picked up some of that. I was out of my matte bronzer (not my contouring one) and my favorite happened to be buy one get one! I was in need of a new mascara so I went back to last summer's favorite, Lashblast waterproof! I won't be doing any big shopping until after vacation! My sister and I are doing this little kids corner thing twice a week this summer, so I'll have some spending money. I'm such a shopaholic. Target promos here are usually available for clothes, making them even more affordable. So far summer is going great! Yesterday, I went to Home Depot (before Target) and bought a couple of paint samples for my room. I decided on this blue/grey/teal color. It's really pretty! Since my sister and I share a room, we both had to agree on the color. We're going to get grey or white bedding, a new white desk, and have silver accents throughout the room. I'm so excited! I can't wait to paint. We're also going back to bunk beds (ours were able to be taken down to normal beds, or put back up). This will give us a lot more space. I'm going to store my makeup in the desk. Once this project is done I'll show you all. It will be awhile though, so don't expect it to be anytime soon! I love the blazer and the dress in particular! JEALOUS! Lemme know how that nair shower works! And that dress is CUUUUUUUUUUUUTTTTTTTTTTTTTTEEEEEEEE! You found some good stuff!!! That $10 blazer was a STEAL!! Oh, I'd seen that first Calypso dress at Target and I thought it was really cute! And the blazer is a really good deal! That first dress is SO cute! I'd love to hear how the Nair works out, I've never tried any of their products. Hey Savannah! I have a few pieces from the Calypso line at Target and I am mad that I did not see this cute dress, lol. It's going to look spectacular on you! those dresses are fabulous!! I am going to have to see if target has that blazer!! The blazer really brings it home! !